The Norwegian Forest cats are known as ‘skogkatt’ or ‘skaukatt’ in Norway, ‘skog’ and ‘skau’ meaning forest in different dialects. 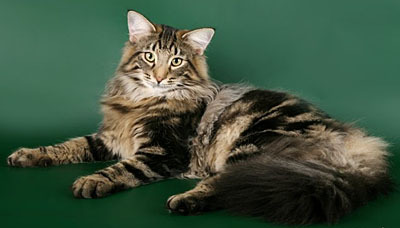 It is believed that the Norwegian Forest cat did come out of the forests about 4000 years ago. Legend has it that travelled the world with the Vikings, protecting their grain stores on land as well as on the sea, and even left their progeny on the shores of America. 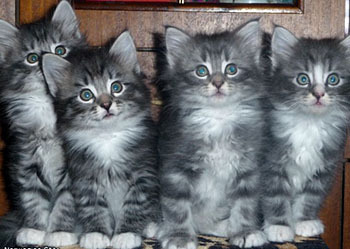 There are no specific types of Norwegian Forest Cats. However, they were not bred from any particular line and hence differ from line to line. The Norwegian Forest Cats look like two different cats in summer and winter. Acclimatized to cold winters, they have a very thick, glorious coat during the cold months. In the spring, they shed their undercoat and look completely different. They also have fur in their ears, between toes and a large bushy tail to wrap around themselves. They are large cats, with males being larger than the females. They are playful, intelligent cats. They love human company and do not enjoy being left alone for long periods of time. They like the outdoors and are considered to be skilful hunters. They like high vantage points and are always climbing trees outside or bookshelves, cupboards, etc. inside the house. They are not high strung, but patient and great to have among children. They are considered to be loyal. They are also known to be highly responsive cats and good talkers. The Norwegian Forest Cats do not need much maintenance except regular brushing during the spring and summer when they are shedding. For a while i’ve been trying to figure out what my kitten way. I got an answer! THANK! I have a kitten like this and his name is, Oliver. One cute breed! omg i have found my kitten’s breed.THANK YOU!!!!!!!!!!!!! !